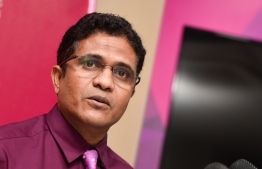 The leader of opposition Progressive Party of Maldives (PPM)'s parliamentary group and former Vilimale' MP, Ahmed Nihan Manik, on Sunday night called for the resignation of PPM's leadership. He confirmed his own resignation on being questioned about his part in PPM's leadership. Nihan, who contested for Thinadhoo South constituency in the recent parliamentary elections and lost, tweeted that all the members in PPM leadership had failed, and must step aside to make room for a new leadership. Moreover, Nihan blamed the party's defeat in last year's presidential elections, local council elections, and parliamentary elections on the lack of a strong leadership. While Nihan has urged PPM's leaders to step down, rumours are circulating about former Vice President Dr Mohamed Jameel Ahmed and former Minister of Home Affairs Umar Naseer taking charge of the party. However, it is unclear whether they are endorsed by former president and PPM's current leader, Abdulla Yameen Abdul Gayoom. Stating that PPM journeyed to presidency in a short amount of time, Nihan credited the party's members with all of PPM's accomplishments. "PPM members are extremely loyal, there must be no room to penalise or sadden them", he said. Nihan further stated that despite his resignation from the leadership, he will still serve the party and the people as a member. PPM secured only five seats out of 87 in the parliamentary elections held on April 6. People's National Congress, which formed a coalition with PPM, won three constituencies. PPM was founded by former President Maumoon Abdul Gayoom. However, he was dismissed from the party and his estranged half-brother Yameen assumed the position of leader, following political disputes between the two siblings.